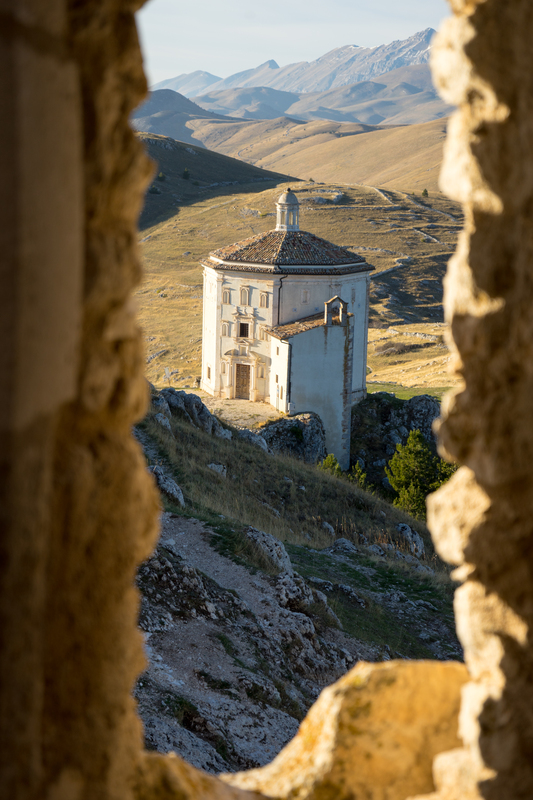 Salemi in Valle del Belice is home to Cucchiara family, where three generations have been making traditional and organic sheep’s milk cheese since 1870. 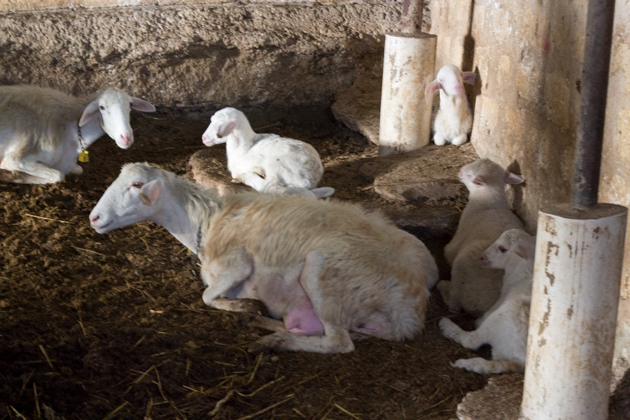 The Caseificio Cucchiara Liborio has 900 sheep which graze on their 90 hectares of land. The Cucchiara family also keep bees to make honey during the Spring and Summer which pairs exquisitely with their pecorino cheese. Their mother makes jams including an orange jam and mandarin preserves which go well with the Vastedda della Valle del Belice DOP cheese. 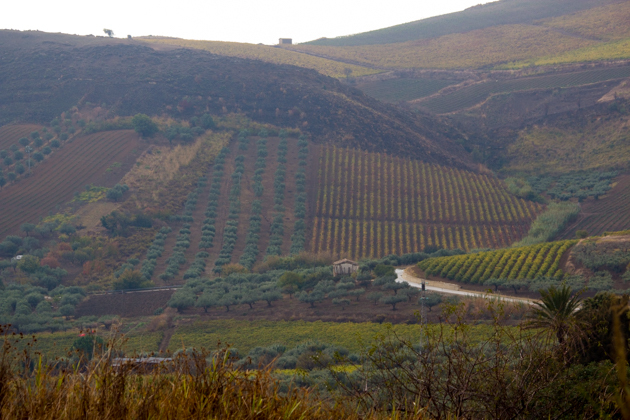 They also make olives (another DOP product from Valle del Belice – Nocellara del Belice). 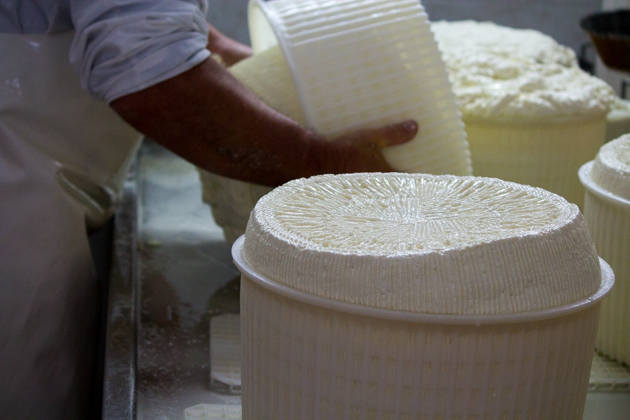 Every morning they make ricotta (sheep’s milk ricotta is more typical in southern Italy whereas cow’s milk ricotta is more common in the north) and either Vastedda della Valle del Belice DOP or Pecorino Siciliano DOP depending on the season. 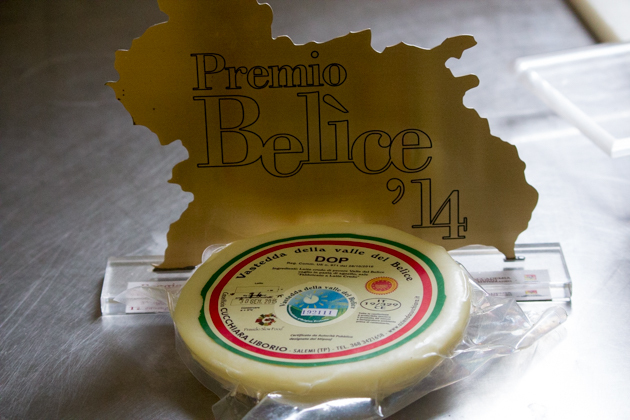 Vastedda del Belice is the only pulled sheep’s milk cheese (the same process in making mozzarella cheese) in Europe. There is a Slow Food presidium to protect this unique product.The Cucchiara family’s Pecorino Siciliano is award winning (it won the Trinacria d’oro award) and is simply one of the most complex yet creamy pecorinos I have tasted. They also have pecorinos flavoured with olives, pistachio, black pepper, sundried tomatoes, rocket and olives. 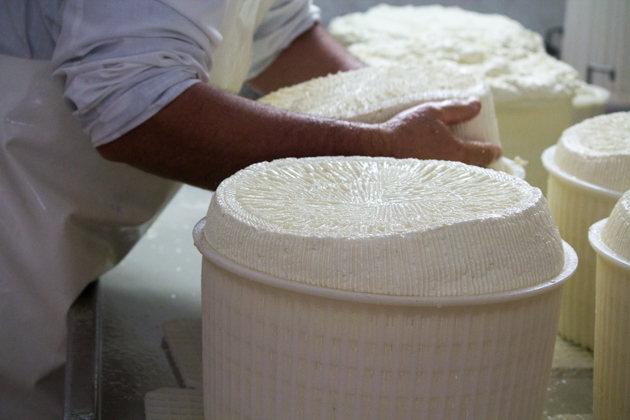 Pecorino Siciliano is Sicily’s old cheese and one of Europe’s oldest cheeses. I arrived early in the morning as the family were starting to work the milk they obtained from the sheep the day before. 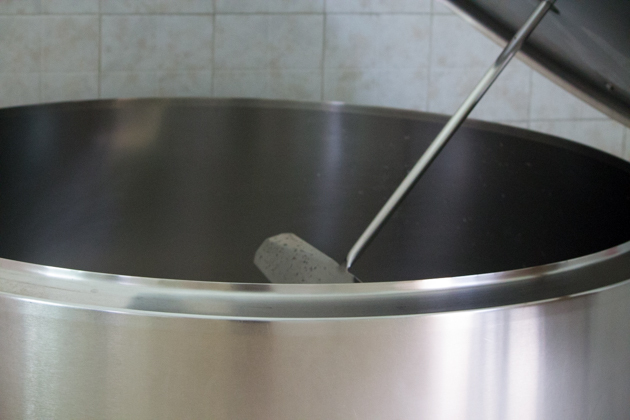 The milk sits overnight in a refrigerated steel vat to allow the cream to separate. 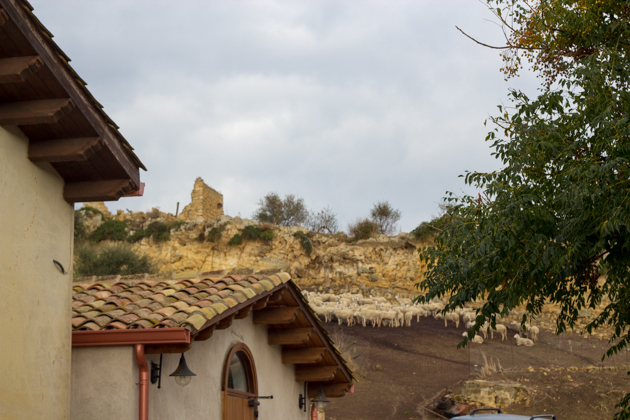 The refrigeration becomes important during the hot Sicilian summers. 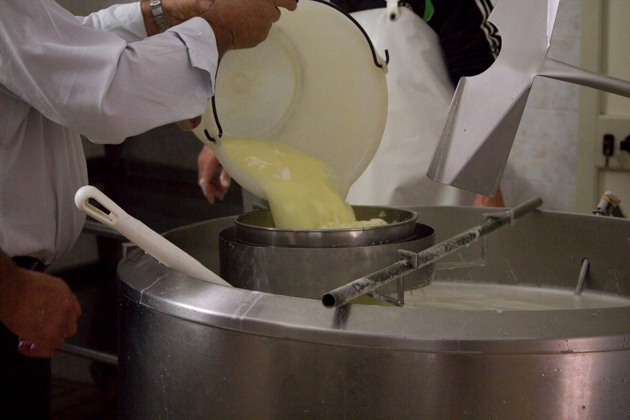 They stir the milk with a large wooden stick to separate the curds and whey, adding hot water to facilitate the process. 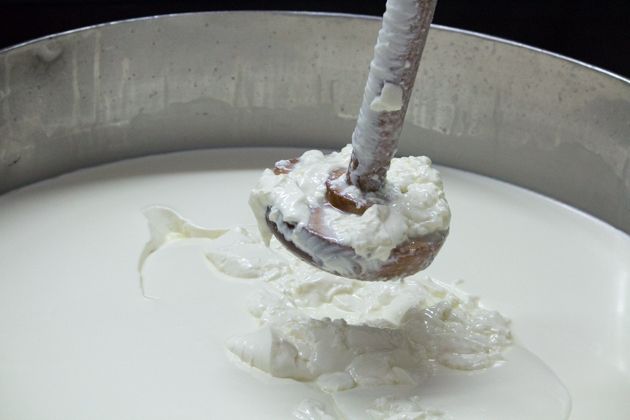 Once the curd is separated out to make either Vastedda del Belice or Pecorino Siciliano, the remaining whey is worked again to make ricotta. 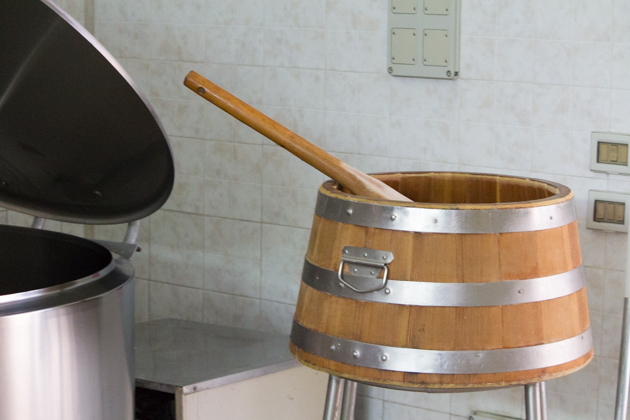 Steel and/or plastic vats are used for Vastedda del Belice and ricotta while wooden vats are used for making Pecorino Siciliano. 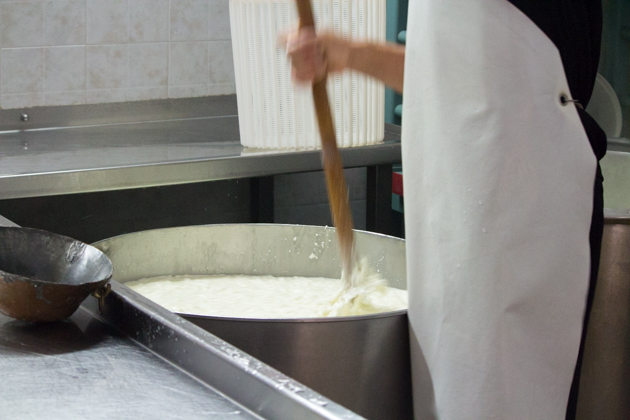 The curds destined for Vastedda del Belice are made from two milkings: one evening and one morning and the cheese must be made within 48 hours of milking. 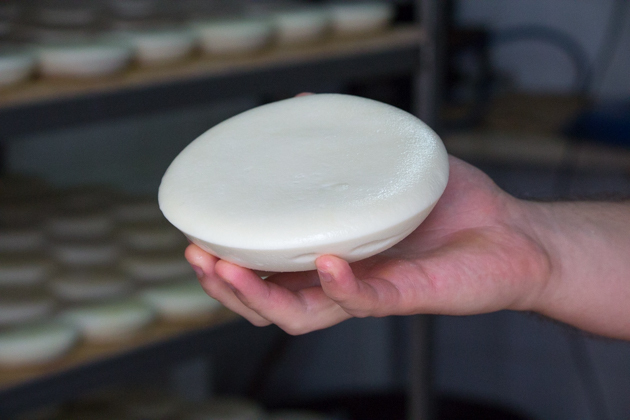 The curds are broken up until they are the size of a grain of rice using a patella (a stick with a lump on the end) and are allowed to rest for 24-48 hours in rush containers. 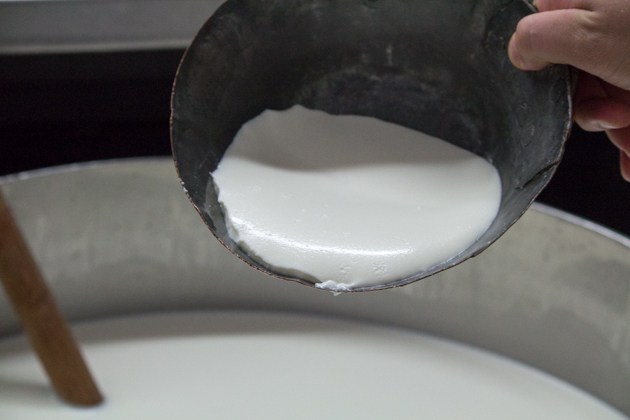 The curd is then cut and placed in wooden containers and covered with hot water or sheets and heated to 80-90C. 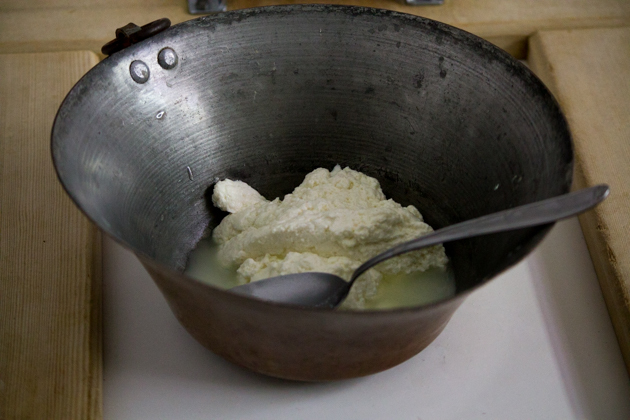 After being heated for 3 to 7 minutes, the curds should have formed a solid block. The now glossy mass is ready to be dried and pulled. It is deemed ready when the strings no longer break. Once pulled, Vastedda del Belice is brined for 30 min to two hours and then aged for 5-6 days before being packaged and sold. The Vastedda del Belice are about 15-17cm in diameter and 3-4 cm deep, weighing between 500-700 grams. 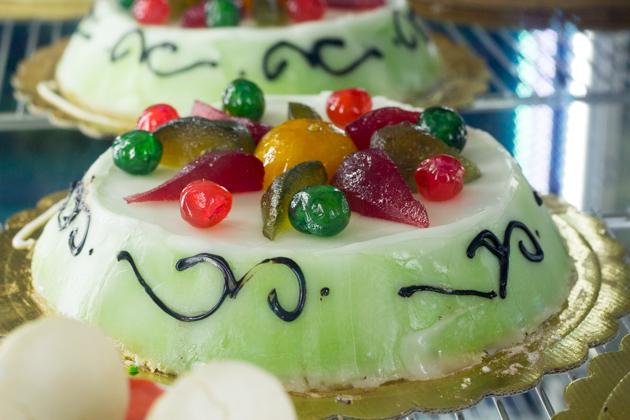 They are a bright white colour and taste sweet and creamy. Vastedda della Valle del Belice DOP can only originate from certain designated parts within the provinces of Palermo, Agrigento and Trapani. 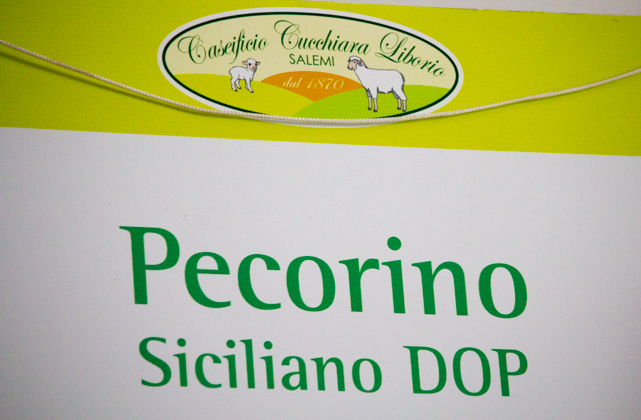 The Cucchiara family makes Pecorino Siciliano only 5 months of the year, from December until April. The wet weather creates an ideal environment for the sheep’s food to be transformed into the perfect milk for making their pecorino. 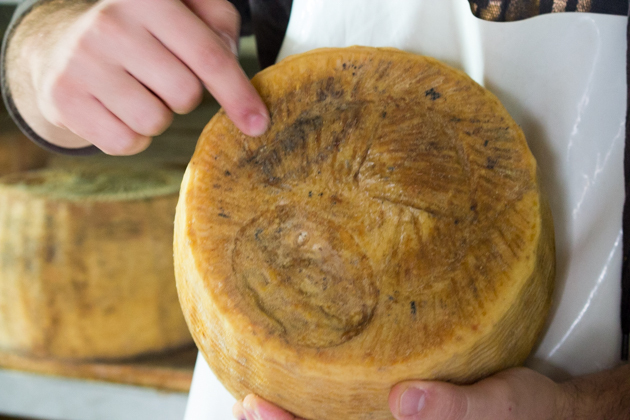 Pecorino is not made during the summer because they eat dry grass. 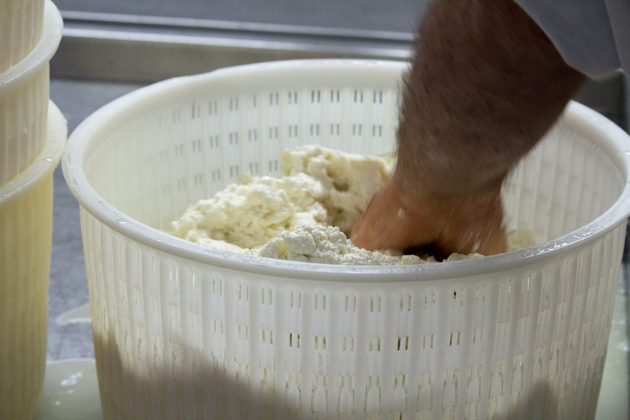 The curds destined to become Pecorino Siciliano are moulded and formed in a basket before being dry salted. If they are sold before they are salted, they are sold as picurinu fresco primo sale. Picurinu nero siciliano is salted and aged 4 months before being rubbed with olive oil and pepper and sold. Still other wheels are hand salted a second time and aged for 80-90 days and are labelled picurinu secondo sale. 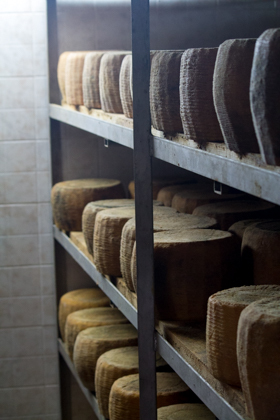 The wheels destined for Pecorino Siciliano DOP are aged for up to 6 to 18 months, depending on the size of the wheel. 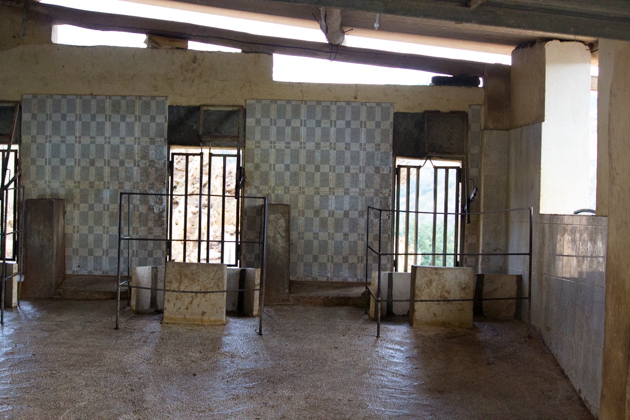 The remaining whey is then drained into another large steel vat and another 15% of fresh milk is added to this when it reaches 50-60C. It is then heated to 80C until it coagulates. 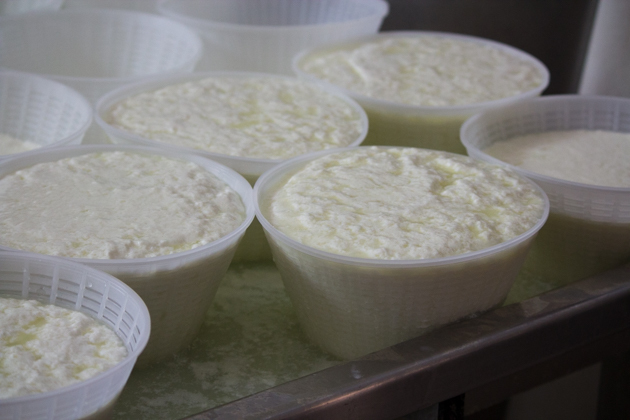 The curd is broken up and strained in perforated plastic baskets for a few hours. During my visit, as the ricotta is being sieved off, eager faced men start showing up and wait until they are offered a steaming metal bowl filled with fresh ricotta. 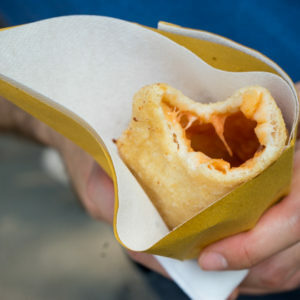 I am given one still warm which is delicious and creamy. The ricotta will be taken into town to make it into shops before lunchtime. Around the towns I noticed signs in the shop windows announcing the fresh ricotta‘s arrival at 11 am. 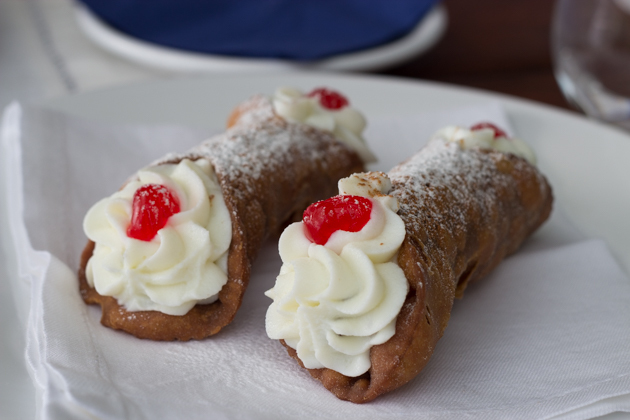 Cooks come and buy ricotta to eat as is or to make into cannoli, cassata or pasta dishes. Need more reasons to eat sheep’s milk cheese? I know some people prefer mild flavoured, creamy cow milk cheese to sheep or goat cheese. They think the latter less complex and too strongly flavoured. 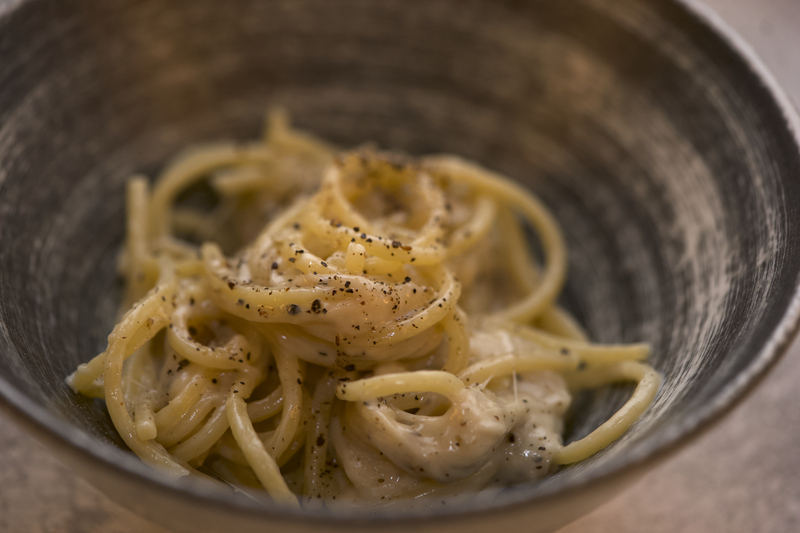 The Pecorino Siciliano DOP I tasted made by the Cucchiara family in Sicily would challenge this assertion as it was as creamy and complex as Parmigiano-Reggiano. 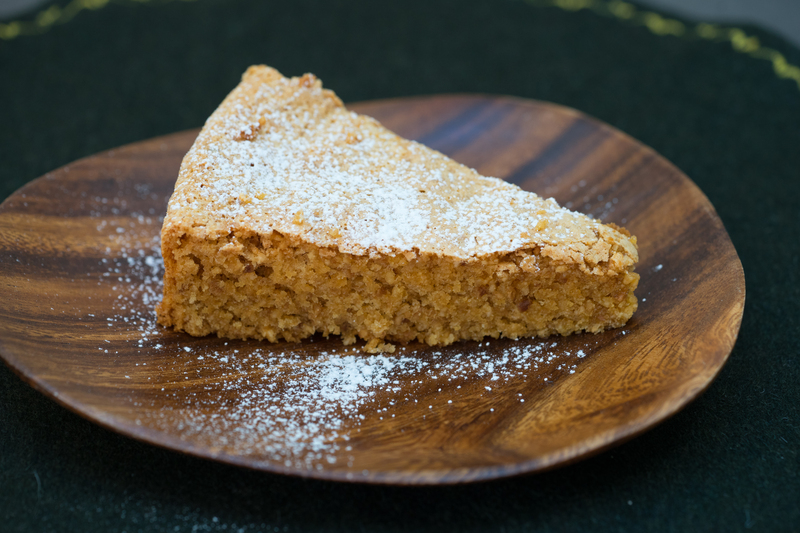 Sheep’s milk is actually creamier than cow’s milk cheese. It is also requires less resources as cows eat 10 times more than sheep yet it takes 10 litres of cow milk to make 1 kilo of cheese whereas it takes 6 litres of sheep milk to make the same amount of cheese. Furthermore, sheep’s cheese is the lower in lactose than cow and goat cheese, making it more easily digestible for people sensitive to lactose.